On-Site has setup our facebook and twitter accounts because we are a social engaging company who cares about our customers. 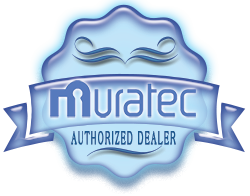 follow us and like us and be in the know when we publish articles about Multi-Funxtion Copiers and Industrial label presses. We would love to hear from you! 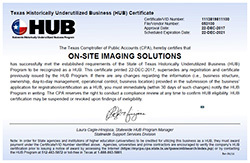 On-Site Imaging Solutions has be been (HUB) Certified meaning The State of Texas Comptroller has seen fit to designate our company as being a company that schools and other institutions are allowed to do business with us as On-Site Imaging Solutions has met or exceeded the criteria for doing business with state owned or run institutions. This is a huge honor for us as we have been seeking this certification from the state to not only boost our business but to ensure that our business meets the states criteria so that you know you can work with us. Getting certified is a in depth process and we are very proud to have achieved this milestone!!! To find out more about the Texas Historically Underutilized Business program visit te Texas (Hub) website! Its the end of 2017 and an end to a fabulous year here at On-Site Imaging Solutions and we are celebrating the coming new year with a brand new website created by Steve Roberts of Kinetic Servers Web hosting, Web Development and Computer Repair. 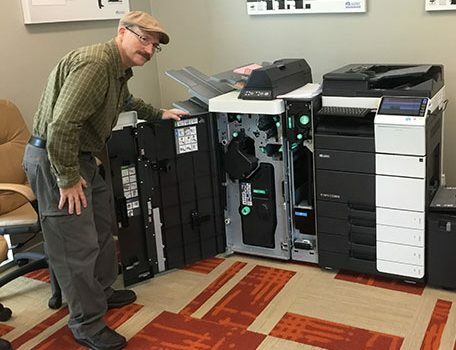 This new site which you are currently viewing has been designed to help you find the right copier or industrial label printer or multifunction printer to serve your business on a daily basis and to service your copier or label printer to keep it in top notch working condition. John and Mimi Christensen are both here to serve you and your business to ensuure you are given personalized support from the sale all the way thru to service calls and our new website will give us the opportunity to streamline this to enable you to be better informed and better served. We hope that the coming year is a prosperous one for you and your business!